From September 7–15, it's September 2018 Asia Week in New York. Several of our regular dealer participants are open to the public, showcasing traditional and contemporary examples of the best of Asian painting, sculpture, ceramics, photography and more. Think of it as a teaser for the March 2019 edition of Asia Week New York! Here's our guide to the exhibitions on view. Many shows remain open past September 15—please check each listing below for details. Dai Ichi Arts, Ltd. is presenting the work of contemporary Japanese ceramic artist HIRUMA Kazuyo 昼馬和代, which will be the first time her award-winning ceramics are shown in New York. "HIRUMA Kazuyo: Memories of Water and Earth" will feature a series of works that highlight Hiruma’s investigation of how memory and erosion come forth in aquatic and terrestrial forms. Ceramic sculptures depicting water and earth inspire nuanced explorations of how these two natural forces interact with time. The works presented are fastidiously constructed yet remain anchored in natural phenomena. Hiruma layers thin sheets of clay horizontally or vertically to create each work, finally glazing and firing the ceramic after spending a month or two building it. The exhibition is on view September 7–21 from 10am to 5pm, at 18 East 64th Street, #1F. Kaikodo's exhibition "The Bountiful Tang" features a photographic portrait of a stunning ancient tree, a gingko planted in China during the 7th century in the early Tang dynasty (618-907), which explodes into breathtaking fall foliage yet today. Michael Cherney, whose work Kaikodo has carried for nearly a decade, felt this particular photo image to be an artistic breakthrough and Kaikodo saw the opportunity to exhibit works of art that were produced contemporaneously during this golden age of Chinese art and literature. Tang-dynasty ceramics, metalwork and sculpture, along with later paintings inspired by Tang styles and subject matter, join the portrait of the tree to celebrate this extraordinary time. The exhibition will be available online and will be on view in the gallery from September 8 to November 9, at 74 East 79th Street, #14B. Onishi Gallery presents "Carving White Translucence: Peter Hamann," a solo exhibition of leading ceramic artist Peter Hamann. Born in Nebraska in 1956, Hamann moved to Japan as a young adult to study Yabunouchi-style tea ceremony. His passion for Japanese culture led him to stay in Japan and pursue the ceramic arts, ultimately enabling him to teach Japanese ceremonial tea techniques and gain his Japanese citizenship. This exhibition showcases the stunning and innovative ceramic pieces that Hamann has refined over the decades, uniquely drawing upon his American roots and Japanese aesthetics. The show is open September 6–22, Tuesday through Saturday from 11am to 6pm, at 521 West 26th Street. An additional exhibition of photography by Koshu Endo entitled "Faces of the Moon" will be on view September 11–22. 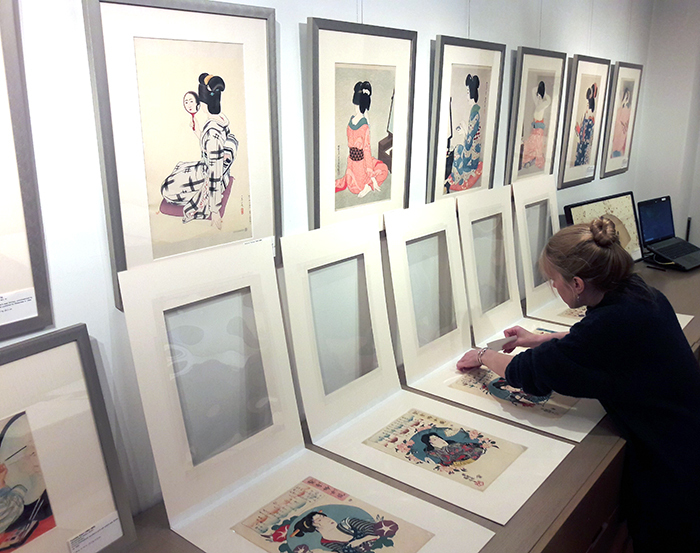 HK Art and Antiques LLC presents the “Life of Women," an exhibition of work by female artists from both East and West. There are three Korean artists, one British artist and one Scottish artist: Hai Ja Bang, Su Kwak, Elizabeth Keith, Tricia Wright, and Myong Hi Kim. These artists, whose work ranges from the figurative to the abstract, use different techniques and materials. In addition to the paintings, there are two Korean 20th century Bojagi (traditional Korean wrapping cloth) on view. The exhibition will be held September 7-18, 11:00am-5:30pm, Saturday and Sunday by appointment only at 49 East 78th Street, Suite 4B. Erik Thomsen Gallery presents an exhibition of porcelain sculptures by Sueharu Fukami (b. 1947), who is widely regarded as one of the greatest ceramic artists of the last forty years. The show will feature around twenty porcelain works with pale-blue glazes created between 1980 and 2018, including two larger scale vertical works, Kei from 2015 and Kō (Splendid Solitude) from 2018, and a true tour-de-force titled Ten (Firmament) from 2013, a wheel-thrown vessel of imposing proportions. The show will also include smaller works, such as vases and incense boxes. The exhibition opens September 10 and runs through November 2 at 23 East 67th Street, 4th Floor. Opening hours are Monday-Friday, 11am–5pm. Kai Gallery presents a group exhibition by nine contemporary artists, including Jared FitzGerald, Han Bing, Min Yiming, Beili Liu, Zhou Rong, Hui Chi Lee, Soon Sik Kim, Gan Daofu, and Myungwon Kim. Aligning with KAI Gallery’s mission, these artists view traditional East Asian culture as a continuous source of inspiration to their artistic creations. Featured above is Myungwon Kim’s Color Study series, which invites viewers to experience not only visual sensations but also physical engagement. In her work, Kim applies her training in printmaking, using its processes, techniques, and materials to create her large-scale gestural works, and implicating her body in the process. Ranging from Han Bing’s environmentally conscious photographs to Jared FitzGerald’s pioneering porcelain panel paintings, the works in the exhibition continue a dialogue between tradition and innovation. This group exhibition generates discussions of our world in the past, present, and future. The exhibition will be on view September 7–15 at 78 Grand Street. The gallery is open Tuesday to Saturday from 9am to 5pm. Zetterquist Galleries will be holding an informal exhibition of Chinese and Japanese Ceramics during September Asia Week. This exhibition features a rare mid-17th century Kokutani plate with notched square form and a masterful painting of a Peacock standing on a rock, surrounded by water. Other works include a large Bizen Horn-shaped wall vase and Chinese Tang Dynasty - Yuan Dynasty ceramics. Open September 10–14 at 3 East 66th Street, #1B. Kapoor Galleries is presenting a group of Indian and Himalayan art during September Asia Week. One of the highlights is this outstanding large and richly gilded Vajrapani bronze. Dated to the 12th century, this sculpture is a rare early image of Vajrapani of majestic size and naturalistic detail of the highest quality. It is one of a group of three which are very closely matched in style, iconography and size. The other two are a Vajrasattva and a Maitreya held in the British Museum and the Cleveland Museum of Art respectively. Other works include an illustration to the Bhagavata Purana: The Liberation of Nalakuvara and Manigriva, attributed to Manaku, and a 15th century Ngor Mandala. Open September 10–14 from 11am to 5pm, at 34 East 67th Street, Floor 3. Scholten Japanese Art's exhibition "KIYOCHIKA: On the Threshold of Modern Times" features a selection of woodblock prints by the influential Meiji-period (1868-1912) self-taught artist, Kobayashi Kiyochika (1847-1915). Born Kobayashi Katsunosuke, Kiyochika was the ninth and last child of a samurai retainer with a hereditary position at a rice granary located on the eastern bank of the Sumida River in the city of Edo. His mother’s family were also of samurai rank and operated a similar granary on the opposite side of the river. While the financial stipends for both families were likely modest, as members of the samurai class they would have enjoyed social status and surely pride in their heritage. In January of 1868, at the age of nineteen, Kiyochika fought for the last shogun in his doomed battle against the Choshu clan in Osaka. He followed the defeated shogun to Shizuoka and managed to support himself as a performer in traveling fencing shows for a few years. Eventually, Kiyochika returned to Edo (by then, renamed Tokyo) in 1874 and began pursuing an artistic career. By his own account, he never formally trained with any master or school, although his own self-proclaimed influences were those of the ukiyo-e artists. Ironically, although his birthright as a samurai was obliterated due to the elimination of the shogunate which crumbled under pressures from foreign powers forcing Japan to open up to trade, in his artistic pursuits Kiyochika embraced foreign influences. He blended his interpretation of the ukiyo-e school with Western-style perspective and realism. Unhindered by formal training within any artistic lineage, Kiyochika’s innovative style helped pave the way for a new outlook on the genre which would be picked up by future print artists, particularly the artists and publishers associated with the shin hanga (‘new print’) movement. The exhibition runs September 7–15, 11am-5pm (otherwise by appointment), at 145 West 58th Street, Suite 6D. Joan B Mirviss LTD is featuring the work of Koike Shōko in September and October with "Shifting Rhythms: The Sculpted Moments of Koike Shōko," the gifted artist’s third solo exhibition at the gallery. Koike has always taken inspiration from the hues of blue created by the sky reflecting off the sea. Early in her career, she began to add glass flakes to her glazes creating a blue “pool” through which she incised shell-like forms. She next gave those “shells” dimensionality by sculpting them in clay. These shell-like shapes, coupled with the puddled blue glaze in shades ranging from Persian blue, to turquoise, to the most recent cerulean, serve as the conceptual foundation for her clay works. While their spiral forms occur in nature, the centrifugal force generated by Koike when using the potter’s wheel to create them evokes for her the rhythms of the universe beyond simply those of the ocean. The clay cores thrown on the wheel then serve as the base for further hand-building and glazing, which ultimately results in pleated, dancing vessels bursting with energy. “First I imagine the shape that dances a certain pulsating rhythm, which then extends to my hands and leads them to weave a form from the mound of clay before me," explained the artist in 2009. "Shifting Rhythms" runs September 11 through October 19, at 39 East 78th Street, 4th floor. The gallery is open Monday through Friday, from 11am to 6pm, with additional opening hours on Saturday, September 8, from 11am-5pm, and Sunday, September 9, from 11am-4pm.